Check back frequently as we have new material all the time. If you'd like to special order an item or have your own material picked out, contact us If you'd like to pick it up you can save the price of shipping, Contact us for pricing. These totes are made with a quilted lining. 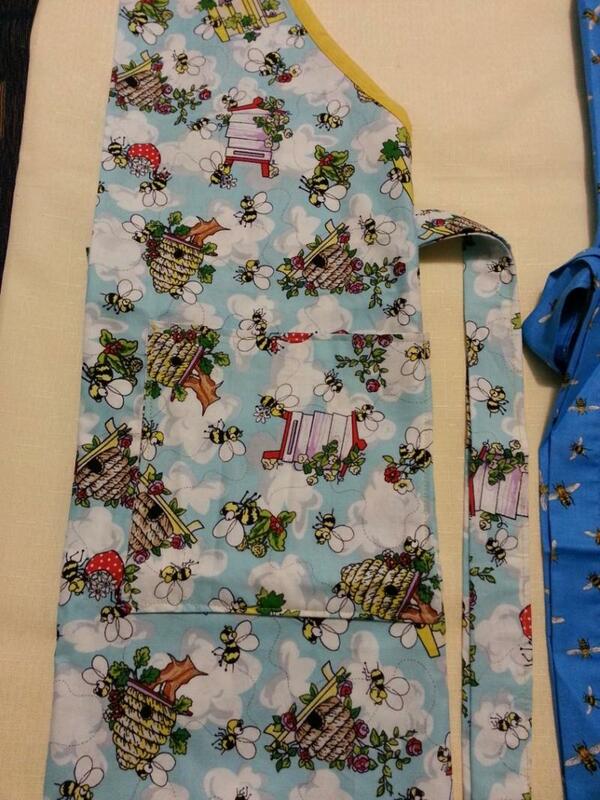 Outside has three pockets and the inside is lined with pockets on both sides. The bottom is lined with a removable plastic to hold the shape of the tote. 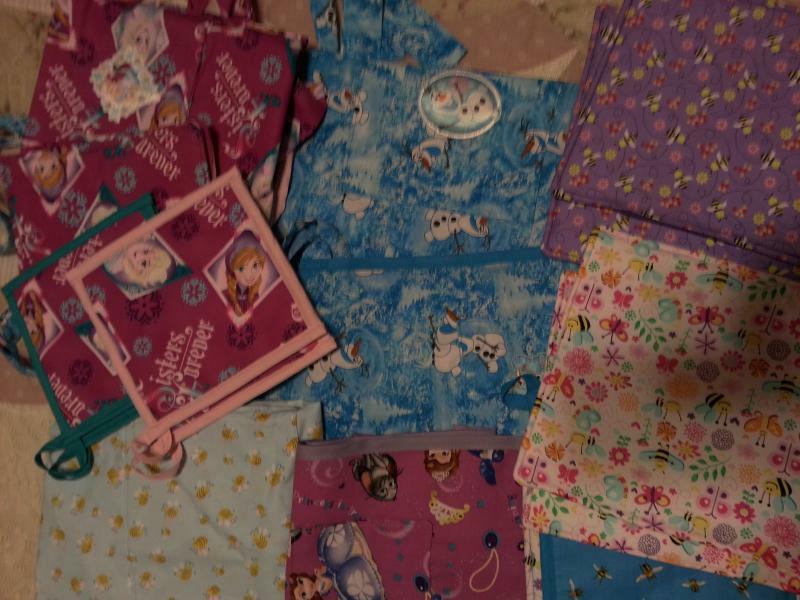 The entire tote is machine washable. Many totes sport a applique on the back as well as the front. We have various colors and patterns. Contact before purchasing. 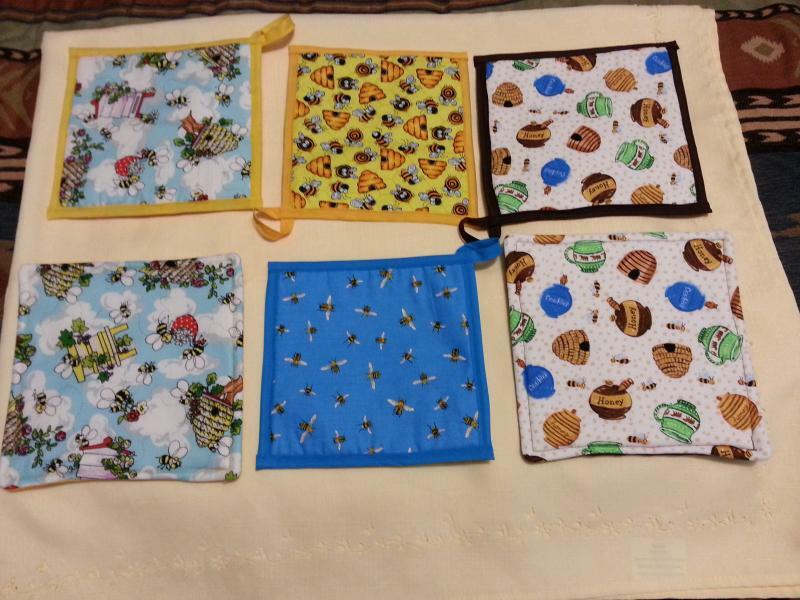 These pot holders are various in sizes; however, most are at least 6" by 7". They have trim and loops so they can hang on cabinet handles. There are numerous designs and trim color, so be sure to specify which design and trim color with your order. These square pot holders are 8' by 8'. Some have loops for hanging on cabinets. If you wish a specific pattern, please note that on your order or contact us. 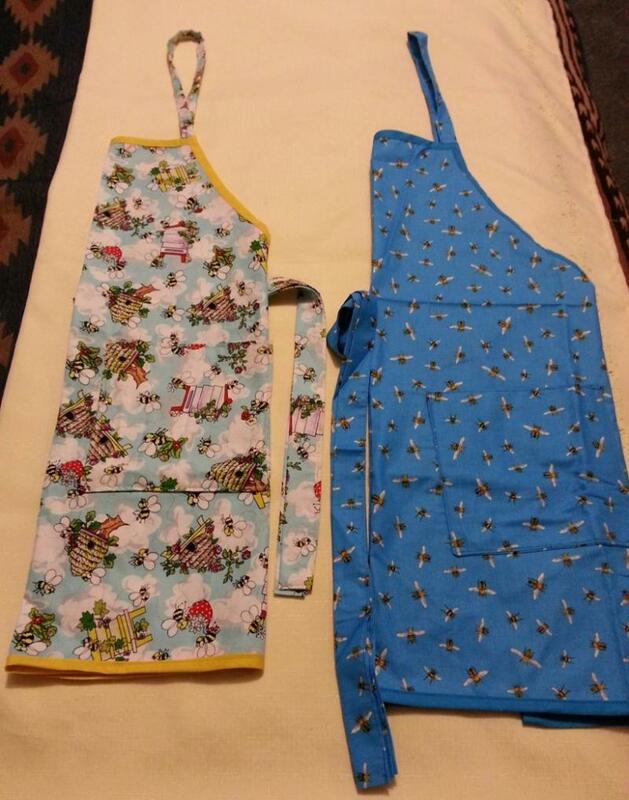 These Aprons are 28" in length from the neck to the bottom and 34" from side to side. The tie is 27" on each side for a full size fit. The loop around the neck is 18". Be sure to note which pattern you'd like. 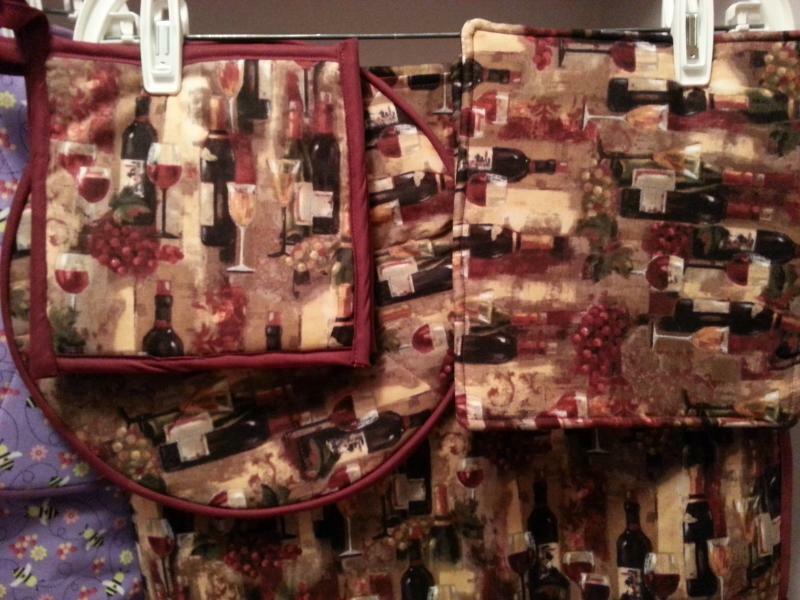 The casserole carriers are insulated and have a special pocket that will hold a hot or cold pack. This will keep your casserole the temperature you desire until served. The carrier will expand to hold a 11" x 13" pan. Each carrier comes with a spoon and the handles are heavily stitched to hold heavy dishes. Trivets are made to sit in your microwave on the round glass plate or may be used on a table to hold a hot dish. You may fold up the sides on heated dish to assist in getting the item out of the microwave. 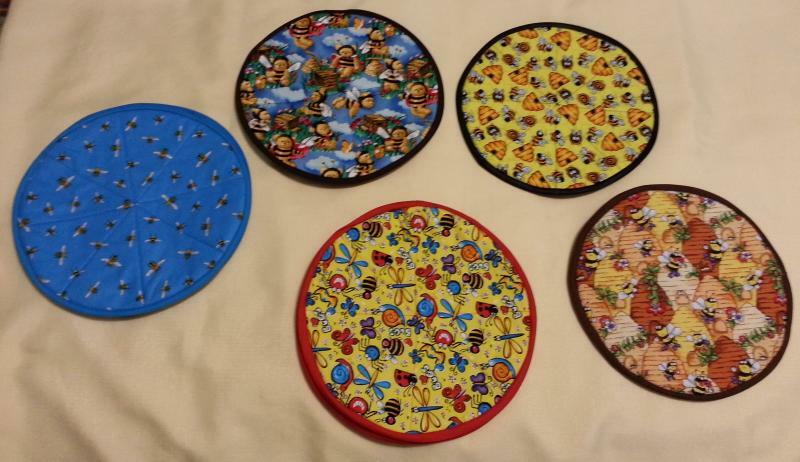 The trivets are 11" round and various patterns. Be sure to note which pattern you'd like. 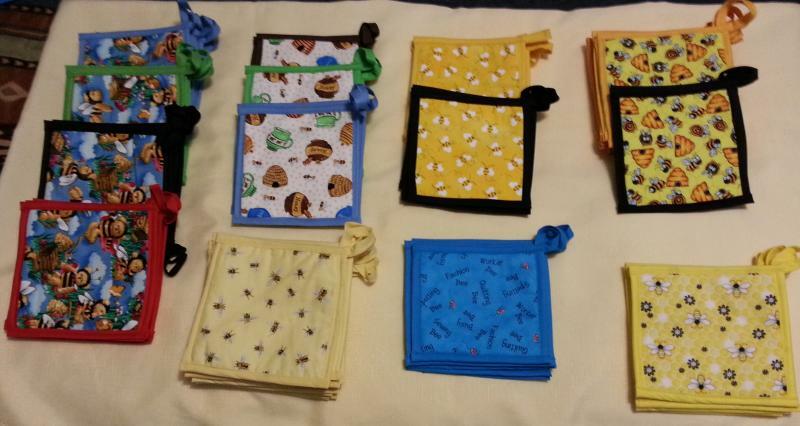 We have some new non-beekeeping material.